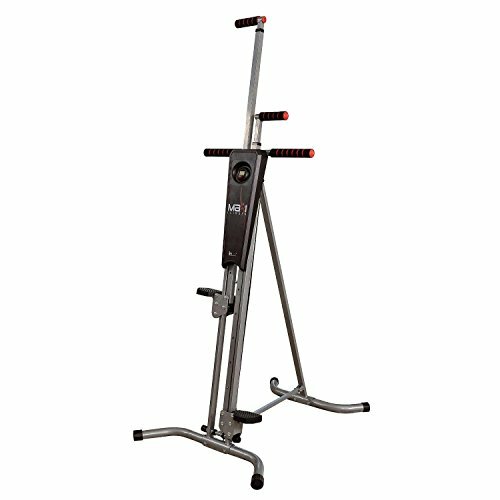 Vertical climber exercise machines advertise themselves as total body home fitness solutions. They work by providing an intense cardiovascular exercise that simultaneously engages the legs, core as well as the arms. These climbing stepper machines emulate the motions of rock-climbing, pitting you against your weight for high-intensity resistance. This form of exercise is designed to increase your cardiovascular endurance while burning calories. 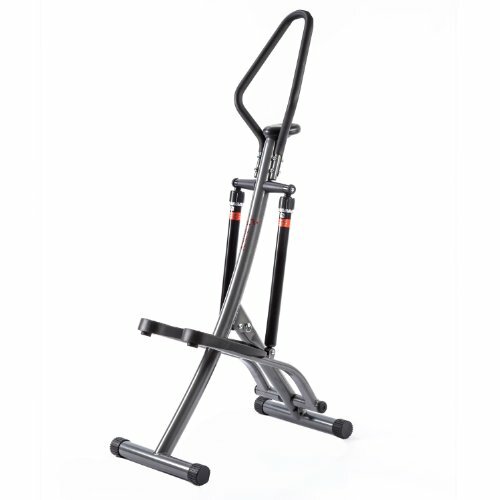 Do these exercise machines live up to the hype? 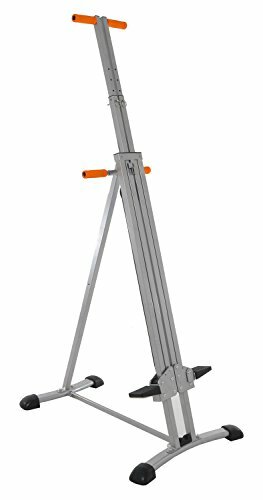 The 33 lb., Maxi Climber Total Body Workout vertical climber is our top pick- it is a height adjustable, completely collapsible option with a 250 lb. weight capacity that arrives 90% pre-assembled. Enjoy the benefits of a rock-climbing workout right in your own home with this vertical climber exercise machine. It is ergonomically designed to work with all body types and sizes. The height is conveniently adjustable to accommodate your proportions. It comes with isometric non-stick grips and a personal workout timer that stops and goes as you do. It is designed to imitate the movement of rock climbing, which is proven highly beneficial for burning calories and strengthening muscles. If you buy this item, it would come 90 percent pre-assembled so you will have very little assembly hassle. One minor complaint is that due to its studded pedals- it’s uncomfortable to use when barefoot. Climbers can clamber aboard to get a complete body workout that accurately mimics the strenuous effects of wall and rock climbing. Fitted with non-stick grips and 4 non-slip rubber pads, you can be assured that it is stable and will stay in place during workouts. If you want to enjoy the physical benefits of mountain climbing but cannot escape on the weekends to a cliffside, try using this stepper. It is designed to replicate the cardiovascular effects of a basic indoor mountain climbing workout with profound affects on calorie burning and overall physical health. It features a strong metal construction and is foldable for easy storage. The climbing machine is fitted with a monitor that displays the number of calories burned as well as completed steps. It also works as a timer. With two adjustable resistance cylinders, it lets you make smooth stepping motions. The overall dimensions of this climber is 27 (L) x 17 (W) x 54 (H) inches. It can carry a person weighing up to 220 pounds. This steel-constructed, durable Maxi vertical climber is designed to replicate an effective indoor climbing workout. Its a great at-home solution for calorie-blasting, as well as for toning and shaping your muscles. It measures 36 x 25 x 84 inches and weighs about 30 pounds. Users weighing 240 pounds or less can safely use this machine. Its pedals rest 6 inches from the ground and rise to about 2 feet from there, effectively imitating a climbing experience. It is also fitted with grips that are adjustable depending on the height of the user. Vertical climbers typically come pre-assembled, which is a feature that users loved. Assembly usually takes around 15 minutes. While there is no resistance setting, the upper handles can be lowered or raised to change the style and feel of the exercise, and accommodate different heights. If you require more strenuous exercise, all you need to do is to lengthen your steps- instead of going halfway down, push all the way down, and you will feel increased intensity. Another exceptional convenience of these vertical climbing machines is that they fold up and store easily. Some users keep them in a closet, others tuck them beneath their bed, while some merely propped them up against the wall when they’re not in use. Reviewers also commented that the machines are pleasingly quiet– this is great because it enables them to exercising while watching TV. It is definitely a piece of exercise equipment that you will need to wear shoes or rubber soled slippers with. Generally the vertical climbers are so well constructed that they do not wobble unless you initiate any extremely vigorous pace. Another reviewer wrote of using a vertical climber and reporting that for best results you really need to pay attention to good posture. Check out some of the videos on this page to see what a proper vertical climber posture looks like. Another benefit that reviewers observed was its small footprint. Many people live in tiny apartments and still want a home exercise product- vertical climbers do not take up much space and as we have previously observed they all are collapsible, which means that storage is a cinch. 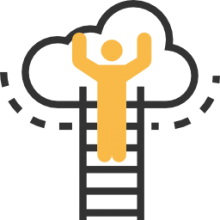 What seems to be the consensus among its purchasers is that the benefits you receive from vertical climbers depends on your expectations and your overall fitness level at the start. If you are less experienced with fitness and exercise, these machines will definitely feel more strenuous and effective, whereas if you are already hitting the gym three days a week and taking personal cardio classes, you may not feel that this piece of exercise equipment is as effective or as strenuous as you would like. One user writes that if you are looking to target your glutes, calves, quads and abdominals, you may be better off purchasing a stationary bike with tension control. Another reviewer writes of purchasing vertical climbing machine after an accident. It has dramatically helped him strengthen his hamstrings and abdominal muscles, enabling him to walk greater distances and resume bicycling. One personal trainer who uses it for cardiovascular interval training was supremely pleased with how little space it takes up and its portability. He writes that it can help his clients reach their target heart rate very quickly. One recent purchaser, and a new vertical climber convert, writes of having used it for two days and experiencing the pleasing intensity of exercise in his legs, arms and especially the inner thighs. A woman who was recovering from her pregnancy and associated weight gain began using a vertical climber so that she should get more toned and then lose the baby weight. Her regimen was 10 to 15 minutes, 3 to 4 times a week, and she quickly noticed beneficial changes in her legs as well as her upper arms and waist. Another female reviewer who is currently pregnant writes of using this as a convenient and safe form of exercise. She loves how quiet it is and how convenient it is to access, whether she wants to use it for five minutes or for a longer workout. Customer satisfaction is a bit all over the board with vertical climbers. One of the good things about buying from Amazon, a trusted online retailer, is that you can often return the device if it is not a fit for you. Some users were somewhat skeptical regarding the claims of a total body workout. Many felt that they needed supplementary exercise to truly target all of their muscle groups effectively. Some users wanted to use their climbers barefoot, but the foot pedal grips were too uncomfortable. Consumers recommend situating the vertical climber on a solid, hard surface rather than a carpet to avoid instability issues. Is a vertical climber right for you? If you are looking for a high-quality home exercise unit that takes up little space and doesn’t break the bank – a vertical climbing machine could be a great option for you.